I first bake this cake actually a few weeks back – into cupcake sizes (the photos I took of them look kind of weird and hence I’m not going to post it) and brought it for one of my tutorials. 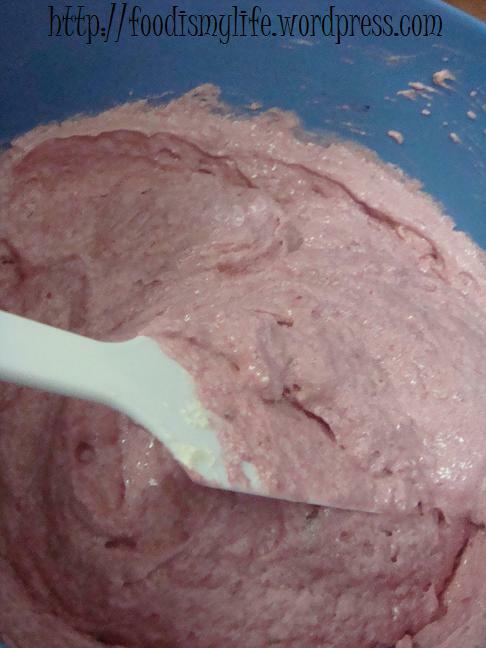 We were doing on a project for PINK®, so I thought of baking a pink cake for my group members – you know, kind of like a celebration (of what I have no idea). I started research for recipes online for a pink cake, and all I stumbled upon are cake mixes, gelatine, strawberry jelly etc etc. Those are still cakes, no offence, but I’m totally turned off by the idea of having to use a mix in my kitchen. I can’t derive satisfaction from using a cake mix or artificial strawberry taste in my baking goods. That’s when I found this recipe. It was fantastic. Not too time-consuming yet interesting to work with. Instead of using the icing suggested in the website, I opted for a strawberry cream cheese frosting. After baking it in cupcake sizes, I now bake it in a 7-inch tin and sandwich them with the same frosting. I think I over-beat the cream cheese and hence resulted in a pretty grainy texture in the frosting and hence I decided not to frost the outer surface of the cake – and well, at the same time I do not wish for the frosting to overpower the taste of the cake itself. Heeding the advice of the reviewers, I added baking powder and sifted the flour, hoping to incorporate more air into the batter. I’m not sure if that made a difference, but the resulting cake turns out to be fairly light yet still a little bit moist. Though the strawberry taste within the cake itself didn’t come out very strongly, I’m still contemplating whether I should use strawberry essence in my next try, as it’s kind of waste if I buy the essence just for this cake. I don’t find major differences in using mashed or puréed strawberries. I guess if I’m baking cupcakes I would mash the strawberries instead of puréeing them – extra surprise bites of strawberries when one sinks his/her teeth into the cupcakes. 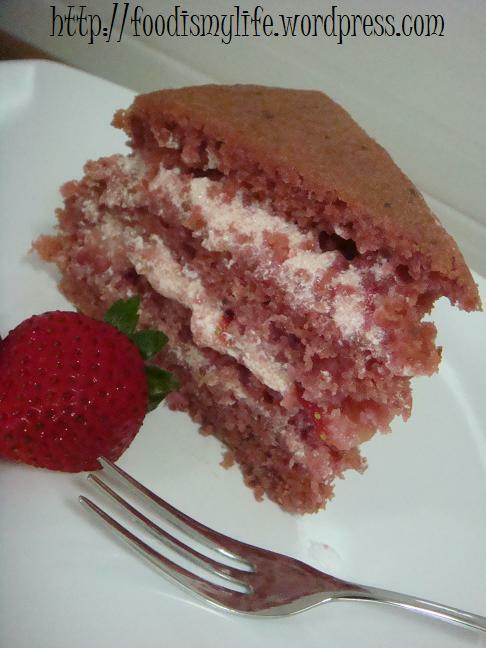 If I’m baking a whole cake, I probably would slice whole strawberries and sandwich them in between the layers (which I did). EDIT (18 Nov 2011): Baked into cupcakes (click to go to the post)! Didn’t frost the cupcakes but they taste yummy nonetheless! Preheat oven to 175 degrees Celsius. Grease two 7-inch round cake pans and line the bottom with parchment paper. In a small bowl, sift together the flour, bicarbonate of soda and baking powder. Set aside. In a large bowl, cream the butter on low speed, then increase the speed to medium then gradually add in sugar till incorporated, 7 minutes. Add eggs, beating well after each addition for 1 minute. Beat in vanilla. Stir in yogurt and mashed/puréed strawberries then fold in flour mixture. Add a few drops of colouring if desired.Divide mixture between the two tins and bake for 25 to 30 minutes or until the top springs back when touched and a skewer inserted into the centre of the cake comes out clean. Let the cakes cool completely. To assemble, split each cake into half. 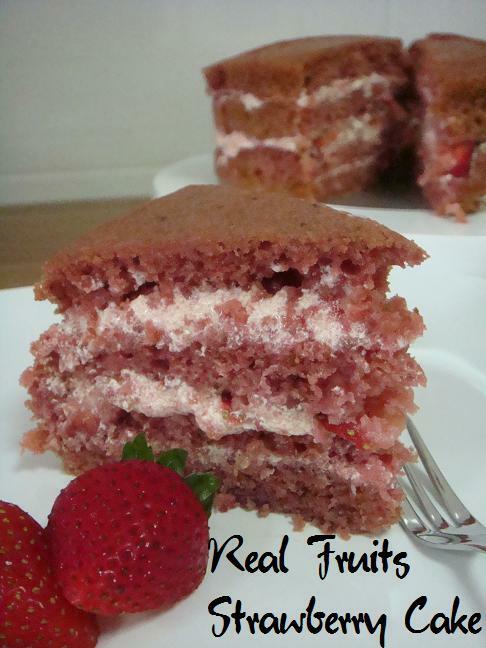 Spread a layer of frosting over one cake half and lay a layer of strawberries. Repeat and cover the cake with a layer of frosting if desired. If baking the cake in cupcake-sizes, divide the batter into 1/4-cup-sizes and bake for 15 to 20 minutes or until the top springs back when touched and a skewer inserted into the centre of the cupcake comes out clean.